Home > 2017 > 02/14 > Gibbons Speaks: On Left Field, First Base, Salty, His Contract, and More! Gibbons Speaks: On Left Field, First Base, Salty, His Contract, and More! 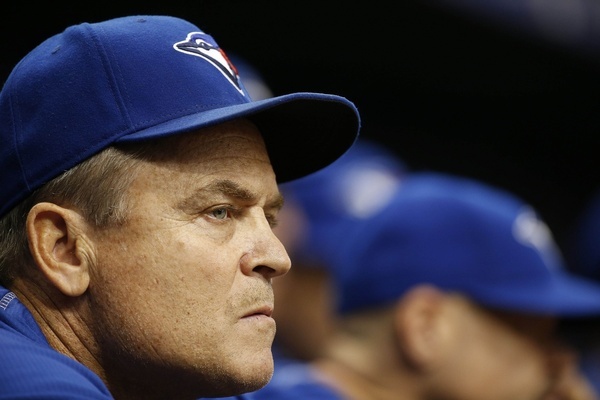 John Gibbons had a brief scrum with reporters today in Dunedin, as you can see in a video over at TSN.ca. And though there was hardly anything too earth-shattering that was said — he reminded reporters that training camp hasn’t even officially started yet, so it’s a bit early for… everything — there were still a few sound bytes worth examining. When asked about Joe Biagini being stretched out — which some people *COUGH* Sportsnet *COUGH* seem to want to make into a bigger story than it really is — Gibbons said that’s “something we’re going to do for Spring Training.” But it wasn’t so much that he said it as it was the way he said it. I don’t think he expects Biagini to end up in the rotation or as a depth starter in Buffalo, and with all the question marks in the bullpen and the success Biagini had in that role last year, I really don’t think anybody else should expect that either. He also says he loves having veterans in the bullpen, just because they’ve been through the grind before. It’s hard to hear the question this is in response to, but it seems to tie into Biagini and how valuable he was back there for them last season. Speaking of veterans, Gibbons has plenty of praise for Jarrod Saltalamacchia, saying that he thinks “Salty” is “going to be a big part of this team.” Womp womp, Reese McGuire. Here’s the real interesting one, I think: asked about the situation at first base an in left field, he explained, “Well, we don’t know yet. We’re going to see how some things play out — see how it shakes out in left field. Y’know, we have our DH in Morales, and we picked up Pearce, who we always liked as a hitter — he’s been on our radar for a number of years. And, y’know, we have — we think Smoaky’s going to have a big bounceback year. So those are things, going in you have some ideas, but they really have to play themselves out.” Key for me in this statement: he wouldn’t commit to a left field platoon (or running Upton out there all the time), and he wouldn’t commit to Smoak at first base — certainly not like he did with Bautista. This is good, obviously, because they shouldn’t be happy with their current “platoon” in left, they shouldn’t give so many at-bats to Upton, and they shouldn’t be letting Smoak play first base with Pearce here. What a manager says about that kind of stuff has a huge element of the political in it. He doesn’t want to hurt anybody’s feelings or alienate anybody or tell the media something that the team doesn’t already know or understand. He wouldn’t have said “we’ll see how things shake out” in right field or imply that Bautista needs to win himself a job — but that he essentially said that Upton, Carrera, and Smoak do means that there’s a chance they won’t! This is good. Gibbons declined to comment on who would start on Opening Day, because… obviously. Just as I was about to hit publish, Shi Davidi dropped some Gibbons news of his own over at Sportsnet, telling us that it was the manager himself that didn’t push for a contract extension this winter — something that some people *COUGH* Richard Griffin *COUGH* would like to make a story of — and that he did it because he felt that Ross Atkins had too much on his plate as it was. “I think we’ll get something done,” he added. It would be pretty difficult to dislike ol’ Gibbers — for a normal person, that is; cluelessly frothing maniac fans, on the other hand… — so I certainly think it’s believable that the will.